Amazing Spider-Man #284 Published Cover (1985) SOLD SOLD SOLD! Click Here To See Amazing Spider-Man #284 Comic Book! 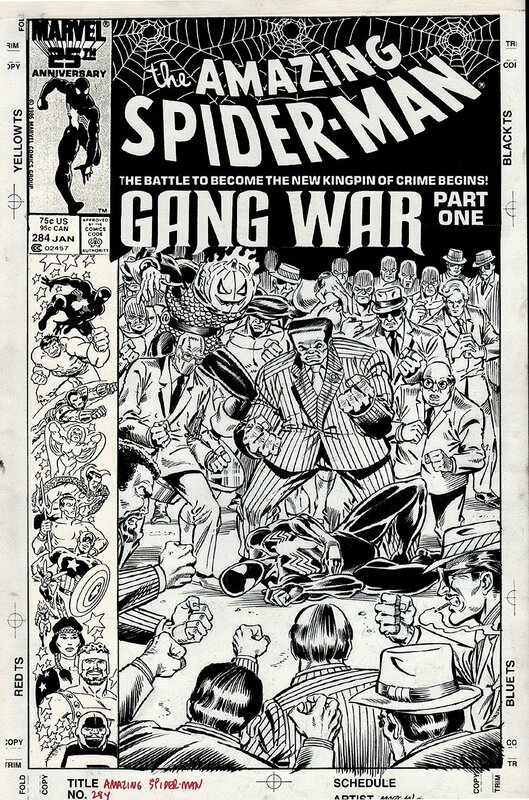 Check out this very nice 1985 Amazing Spider-Man cover, which was penciled by Tom Morgan, and inked by Joe Rubinstein, from the classic story titled: "Gang War!" 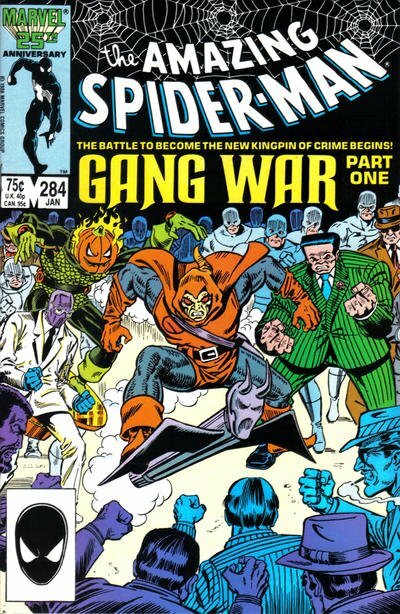 This nice cover features the Black Costume Amazing Spider-Man on the ground as he is defeated and looked down upon by several key Spider-man foes: Hammerhead; Rose; Jack O' Lantern and The Arranger! AFTER this cover art was drawn.... It was decided by editors that THE HOBGOBLIN should be the main focus of the cover, so they statted this original cover art and moved Hammerhead farther to the right on the cover and covered Spider-Man's image up with a Ron Frenz drawn image of the Hob-Goblin! The entire bottom scene of villains, AND Rose / Jack O' Lantern with back left thugs are in their EXACT position on the published cover. The Arranger which was drawn nicely on this cover...you can only see his right arm on the comic book image as his image was moved too far to the right on the stat cover to be seen, but he DID make his full appearance on this great cover! More than likely....There is a single Published Hob-Goblin drawing floating around somewhere that would be part of this cover.....But in his place....having a full body image DRAWN image of SPIDER-MAN in his BLACK COSTUME is not too bad to have on an Amazing Spider-Man cover. Just a great cover! Compare this nice cover art to the published comic book in the red link above! ALL HIGH end pieces of art, including this one, are able to be purchased with VERY fair time payment plan options, and trades are always considered towards this and "ANY" art on our website! Just send us an email to mikeburkey@aol.com and we can try to work something out.